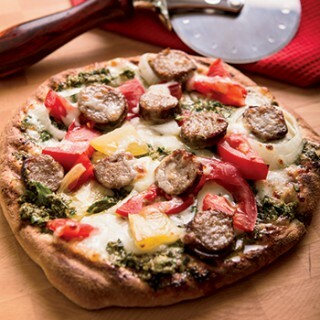 A heartier summer pizza, this recipe features Italian sausage and fresh tomatoes. Nutrition Highlights: Basil leaves, used to make basil pesto, are packed with natural phytonutrients and antioxidants. Divide pizza dough in half. On a floured surface, roll into two 8-inch circles. Place on lightly floured baking sheet. Oil grill grates and preheat grill to medium-low heat. Place the pizza crusts directly onto grill grates. Close cover and cook 1 to 3 minutes or just until the dough puffs and bubbles up in some places and starts to become firm. Remove crusts with tongs, turn over and place on baking sheet. Spread grilled sides immediately with half the pesto, then sprinkle with half the onions and shredded cheese. Top with tomatoes and sausage slices, dividing evenly between the pizzas. Return pizzas to grill, cover and grill for 3 to 5 more minutes until the crust is crisp and cheese is melted. Remove pizzas and cut into 4 slices each.